Step 1 - Pre-Wash Conditioner - 488ml - $9.99 - formulated with a combination of fleximax volumizers and fibre polishing actives to prep the hair for voluminous bounce before even shampooing as well as binding to the cuticle to protect hair during washing to leave it smooth and polished. Step 2 - Shampoo - 739ml - $9.99 - formulated with fleximax volumizers to help control static to infuse hair with volume and leave it perfectly prepped for styling. 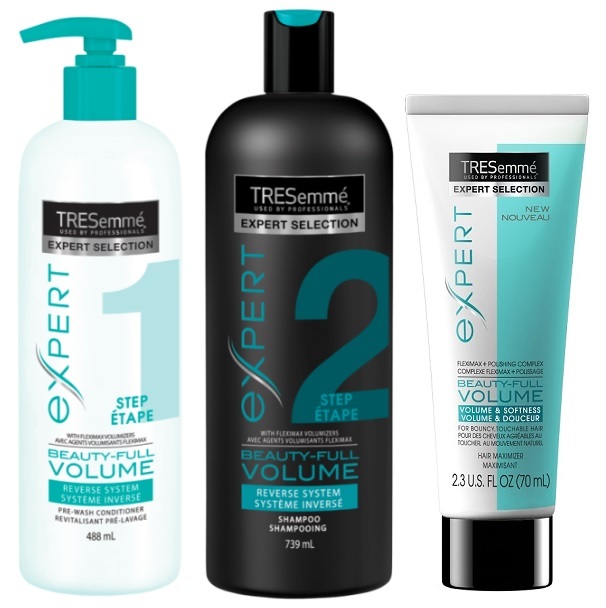 Step 3 - Volume Maximizer - 70ml - $9.99 - contains a combination of fleximax volumizers to help create volume and fiber polishing actives which smooth the hair's cuticles. To leave hair feeling soft and full of bounce and body air without feeling stiff or sticky. Available now at drug and mass retailers across Canada and stay tuned, I will be testing these out these week and will let you know my results! This is a really unusual concept, and I really wanna get hold of it to give it a go! Do you have any thoughts/opinions on it? Stay tuned, I will be updating once I've had a chance to try!